July 2012: Whether you read this now, a year, three years, six years from now, the question will remain the same. When a murderous mass shooter starts killing people in a theater the question is, "Who's gonna shoot back?" When a killer starts shooting people in a mall the question is, "Who's gonna shoot back?" When somebody starts shooting people on a college campus the question is, "Who's gonna shoot back?" When a low life form begins shooting people at a church the question is, "Who's gonna shoot back?" When a useless murderer opens fire on students in a high school the question is, "Who's gonna shoot back?" And yes, that applies even if the shooter is a 15 year old. 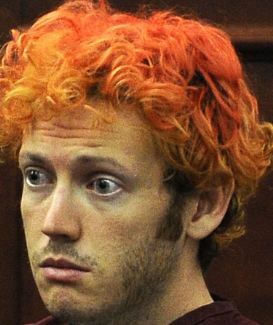 Over the last couple of weeks I've sat and listened to the nauseating banter on Fox News and others about this jackass, James Holmes. Because his sorry life didn't end when he shot 70 people, killed 12, now he's on trial. But it's got to be determined if he's "competent" to stand trial. The most regrettable thing is that somebody in the crowded theater didn't turn his hair that color by shooting through his gas mask. Instead, now, he's a ward of the state, and whatever happens, it will go on for years, possibly decades. But here's the real issue. It doesn't matter what happens now. The maximum number of people he was capable of wounding and killing is already determined. He was not stopped when he began shooting. The only thing that would have made a difference is if somebody had killed him on the scene when his rampage started. That's the only issue in which the body count is determined. The theater was complicit in the murderer's rampage. They gave him access, forbid law abiding citizens with guns, and had no armed security. Blood is dripping from the theater owners' hands. Nobody was available to shoot back. Sound "hard" for a Christian? That's because I'm expending all my "care" for victims, past and the inevitable ones to come. None of it goes for the likes of the murderous clown above or other of his ilk whose lives should be ended before the victims pile up. Gun control, weapons bans, disarming law abiding citizens, legal ccw guns forbidden in businesses, lack of armed security (paid or civilian). People guilty of these pursuits and incompetence attempt to ban the one solution to the body count of murderous death merchants. For those people, there is a sea of blood to wash off their hands. Murderers have weapons with or without "gun control." When you go out, for your sake and others, be part of the solution. Go armed. Going forward we have to keep it absolutely simple. Anybody fighting against the real solution, law abiding armed citizens, is guilty of the victim count.